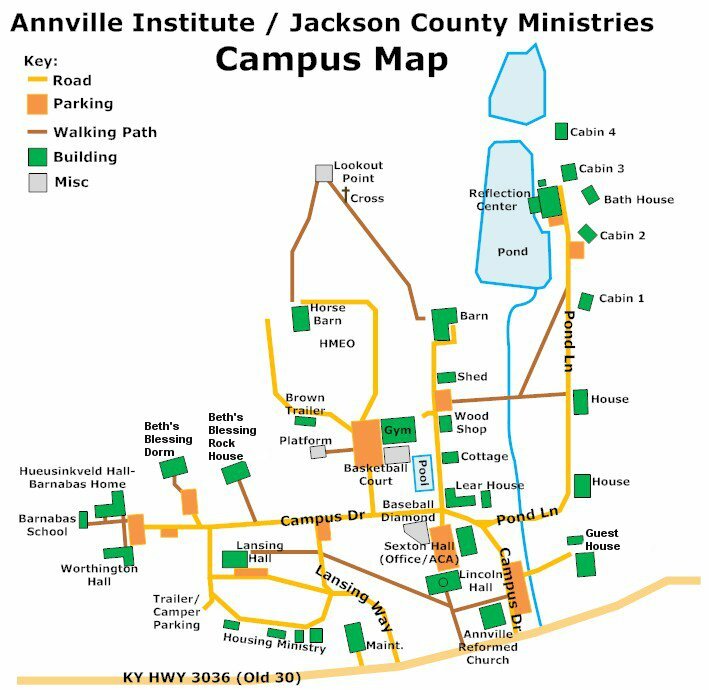 Driving Directions to Annville Institute / Jackson County Ministries. New road opened in Nov. 2010 - final portion not on maps or GPS systems. 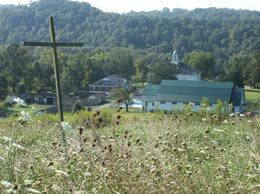 Most GPS Systems will still show our old address of 4500 Highway 30 W, Annville, KY 40402. Our new physical address is 190 Campus Drive (Campus Drive is listed as Town Road on some GPS systems). Drive East (left) from the exit ramp and go to the second stop light. Going straight you will enter Hal Rogers Parkway. You will travel about 12 miles on this road. Turn left on Hwy 3444 and travel about 1/2 mile. You will travel about 1 mile and you will see a Shell Station on the right - and a bank on the left. Travel about 200 yards down the small hill and there will be the first stone entrance (another and bigger stone entrance is about 1/8 mile further) on the right (Campus Drive) you will drive by the church follow the road as it curves to the left and you will see Hacker Gym (white building with green steel roof on the right). Drive East (right) from the exit ramp and go to the first stop light. Drive straight onto #3630(old 30). You will travel about 1 1/4 mile and you will see a Shell Station on the right - and a bank on the left. Travel about 200 yards down the small hill and there will be the first stone entrance (another and bigger stone entrance is about 1/8 mile further) on the right (Campus Drive) you will drive by the church follow the road as it curves to the left and you will see Hacker Gym (white building with green steel roof on the right). Take 421 N to Tyner. At Tyner (postoffice) turn South onto Highway 30 towards Annville (about 5 miles). Drive straight onto #3630 (old 30).